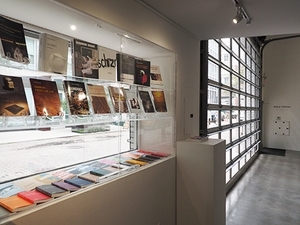 ARTBOOK @ SWISS INSTITUTE was a two-year curated pop-up bookshop (2014-2016) at the Swiss Institute contemporary art center in New York. For each new exhibition, ARTBOOK freshly installed an entirely new thematic focus, new choice of titles and eclectic selection of publishers. Browsers and collectors alike were treated to a library-quality display of new releases, classic titles, museum catalogues, out-of-print and rare books, hard-to-find treasures, indie magazines and limited editions. Each theme store was conceived in collaboration between ARTBOOK's Skuta Helgason and the Swiss Institute's curatorial team, with input from artists.